Microsoft Office Home and Student 2007 is the essential software suite for home computer users that enables you to quickly and easily create great-looking documents, spreadsheets, and presentations, and organize your notes and information in one place, making it easier and more enjoyable for you to get things done. The latest version features the Microsoft Office Fluent user interface that exposes commonly used commands, enhanced graphics, and formatting capabilities that enable you to create high-quality documents, plus a powerful note and information organization tool, and more reliability and security with the Document Inspector tool and improved automatic document recovery. With these enhancements, Office Home and Student 2007 makes it easier and more enjoyable for you to get tasks done at home. Buy Office Home and Student 2007 (with or without a new PC) between March 5 and September 30, 2010. Install and activate your copy of Office Home and Student 2007 by September 30, 2010. This qualifies you to upgrade to Office Home and Student 2010. Once Office Home and Student 2010 is available, simply go to www.office.com/techg by October 31, 2010 to download it at no additional cost, or purchase a DVD for a fee. Follow the online steps to verify eligibility. You will need an activated Office 2007 Product Key. Office Home and Student 2007 has new graphics, formatting galleries, and the Office Fluent user interface that exposes commonly used commands. These features enable you to easily produce high-quality documents that you can be proud of. Results-oriented Office Fluent user interface makes it easier for you to find and use product features. More stable bullets and numbers help you to consistently format documents. Enhanced text effects, SmartArt diagrams, and graphics and charting galleries provide you with more formatting choices. Themes create a consistent appearance across Microsoft Office system programs. Microsoft Office PowerPoint 2007 features new context-sensitive tabs and easy-to-use galleries that make it simple for you to include tables and other graphics in your documents. With an improved automatic document recovery tool and the new Document Inspector tool for removing personally identifiable information from your documents, Office Home and Student 2007 helps you work with more confidence and security. Document recovery tool helps you retrieve Microsoft Office documents after a system failure. Document Inspector detects and removes personally identifiable information, comments, and tracked changes from documents. Document Inspector can help you detect and remove personally identifiable information or unwanted comments from your documents before you share them with others. 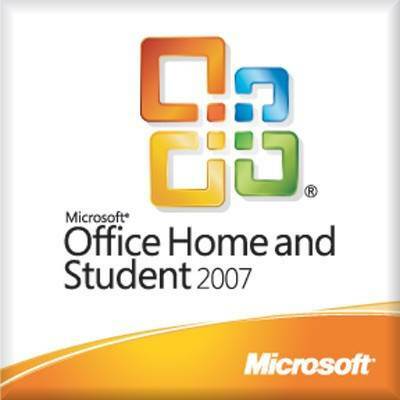 Office Home and Student 2007 has the Office Fluent user interface and an enhanced Help system, including online tutorials with step-by-step instructions. With these features, you can quickly learn the product and find the answers to your questions. Command tabs on the results-oriented Ribbon reveal commonly used commands that previously appeared only in lengthy drop-down menus. The Help system offers a smooth transition between the Help menu in the Microsoft Office system and Help on the Internet (when connected). Larger, more informative Enhanced ScreenTips provide help about commands. Command tabs are context-sensitive, changing automatically depending upon the task that you are trying to complete. Online tutorials provide step-by-step instructions for common tasks. In Microsoft Office Excel 2007, the Office Fluent user interface is organized into logical command tabs. The Ribbon brings to the surface common commands that were previously buried in drop-down menus. Microsoft Office OneNote 2007 is a digital notebook that helps you gather, organize, and search many types of information in one place. Gather many different kinds of information — typed text, images, audio and video recordings, digital handwritten notes, Web clippings, and more — on the same page! Provides flexible note-taking tools to help you organize information the way you want. Categorize important projects or information in a way that makes sense to you, using an easy-to-use layout of notebooks, sections, and pages. Type or organize content anywhere on the page and track important items with customizable note tags. The powerful Instant Search feature of Office OneNote 2007 helps you to find information you are looking for quickly. With it you can even search handwritten notes, the text in images and scanned documents, and spoken words in audio recordings. Office OneNote 2007 is organized into notebooks, sections, and pages, which helps you arrange your notes the way you want.